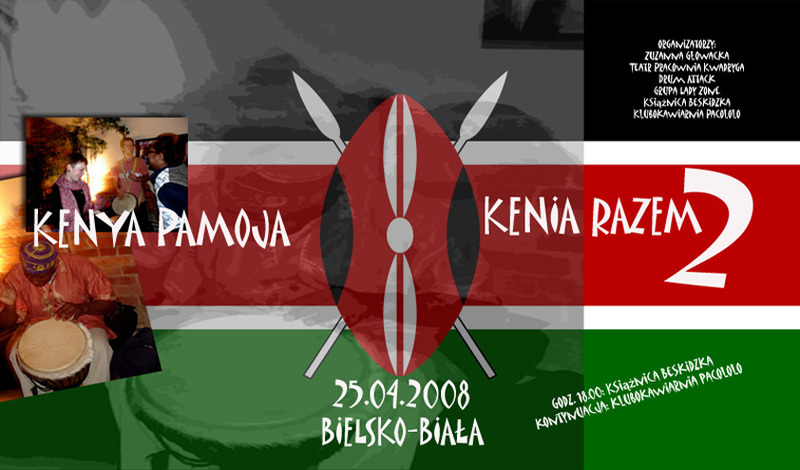 In the name of Pracownia Kwadryga Theatre we invite you to take part in forthcoming Kenyan evening named Kenya Pamoja - Kenya Together, which will take place at 25th April - Friday - in Bielsko-Biała. The event will be opened at 6th pm in Książnica Beskidzka (Słowackiego Str. 17 a), and shall be continued in Pacololo Cafe-club (Mickiewicza Str. 21). The event schedule includes many interesting items, which will present Kenyan and African culture. Music, pictures, food, short swahili lesson as well as an omnipresent drums rhytm will let you feel hot African climate! Kenya Pamoja is not only an opportunity for communing with culture. The main idea of this undertaking was arousen as a response on sociopolitical situation, which affected Kenyans after the general elections which took place at 27th December 2007. The organizers arrange a fund-raising for the benefit of people who suffered from previous happenings in Kenya. All the collected money will be given to the Verbists mission in Eldoret. During the first Kenyan Evening the organizers collected 3,500 Polish zloty.